At the age of 25, Jeffrey Segal was diagnosed with multiple sclerosis (MS). Within two years, he was spending the better part of his days in a wheelchair due to balance difficulties, partial paralysis, visual impairment, chronic fatigue, and a host of other symptoms common to those with MS. Jeff was unwilling to yield to the disease, and instead, launched his own wellness and rehabilitation program. Jeff's additional include NSCA Certified Strength and Conditioning Specialistï¿½ (CSCS), as well as an NSCA-Certified Personal Trainerï¿½ (NSCA-CPT) by the National Strength and Conditioning Association Certification Commission. The CSCS credential was established for college graduates who apply science and knowledge to train athletes for the primary goal of improving athletic performance. The NSCA-CPT program, which is the first nationally recognized personal training credential, established as a means of identifying individuals who possess the knowledge and skill to competently and safely train both active and sedentary individuals as well as those with special health and fitness needs. While managing his MS with both wellness and pharmaceutical strategies, Jeff continues to thrive using functional and progressive training modalities. In 2004, Jeff founded Balanced Personal Training Inc., based in Boca Raton, to pursue his dream of empowering others in all stages of MS, as well as pre/post-rehabilitation, and helping physical needs of all people. His unique approach to training is geared toward improving function, range of motion, self-esteem, emotional wellness, and quality of life. Jeff is also So-Owner of Personalize Your Fitness, LLC with longtime friend and highly recognized personal trainer, Sheridan Rafer. 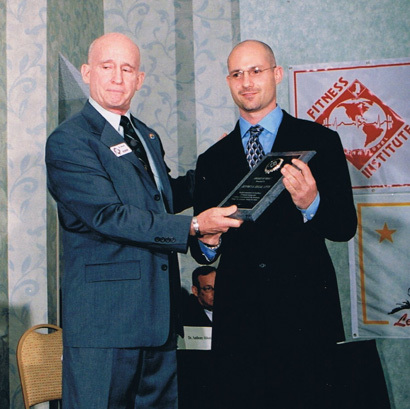 In 2007, Jeff was awarded the distinct honor of Personal Trainer of the Year by both The National Strength and Conditioning Association and the Fitness Institute International. Jeff is available for speaking engagements at support group meetings, educational and patient programs, corporate motivation, and other health and wellness events. His lectures are suited for fitness professionals as well as those looking for motivation. He is available as a personal trainer for all levels of ability. In addition, Jeff is a CEU provider for the National Strength and Conditioning Association. Email Jeff at Jeff@balancedpersonaltraining.com or call 954-818-9396.